Gene manipulation tools are routinely used to create genetically engineered bacteria to understand the function of a gene or its role in pathogenesis in case of an infective microbe. Genetic engineering and manipulation of genes have been the fundamentals of biotechnology and pharmaceutical industries to screen for relevant strains of microbes. Screening of mutant and the recombinant strains is an arduous and time consuming process involving molecular and immunological assays. Inquisitiveness of scientist to understand the biology of a pathogen that causes outbreak and the role a specific gene product play in causing such ailment necessitate the development of new methods for screening and isolation of mutant strain(s) deficient in a specific gene. We applied a noninvasive laser scatterometer, known as BARDOT (bacterial rapid detection using optical scattering technology) to differentiate mutant bacterial colonies that are deficient in a specific infectious gene product from the wild type (WT) colonies based on the colony scatter patterns, in a model pathogen, Listeria monocytogenes. Fig. 1. BARDOT machine and its application in differentiation of mutants from wild type (WT) based on optical scatter pattern during coinfection study. ΔinlA represent in-frame deletion of internalin A gene, and lap- mutant has disrupted listeria adhesion protein (LAP) in Listeria monocytogenes. BARDOT is a novel, label-free, real-time analytical tool that has been applied in the screening and detection of various foodborne and clinical bacterial pathogens such as Listeria spp., Vibrio spp., Shiga toxigenic E. coli, Salmonella enterica, Bacillus spp., and several genera of the Enterobacteriaceae family. BARDOT instantly screen bacterial colonies after passing laser beam through each colony present on a Petri-dish. This generates a light scatter signature that is specific to each bacterium (analogous to a human fingerprint) and enables screening and differentiation of mutant strains after matching the scatter pattern with the library that consists of scatter images of relevant mutant strains that are deficient in specific virulence gene. 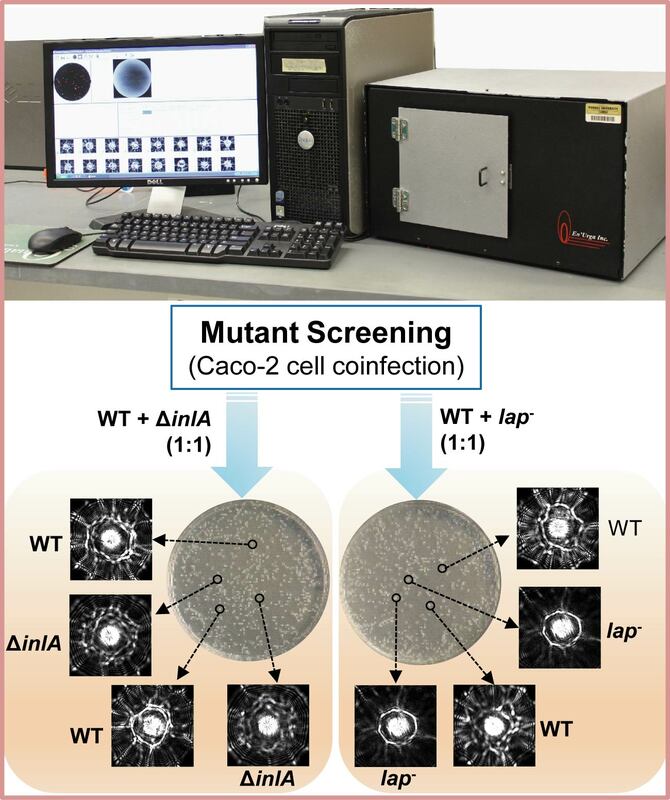 In this study, coinfection experiments were performed with the WT and mutant strains to enumerate the relative abundances of these strains during infection of immortal mammalian intestinal cell line (Caco-2) under in vitro condition to determine the importance of a specific protein (biomolecule) in pathogenesis (Fig. 1). In the Caco-2 coinfection study, BARDOT was able to differentiate, identify and enumerate mixed colonies of the WT and mutant strains (lap mutant and ΔinlA), which were visually indistinguishable on the brain heart infusion agar (BHIA) plate. 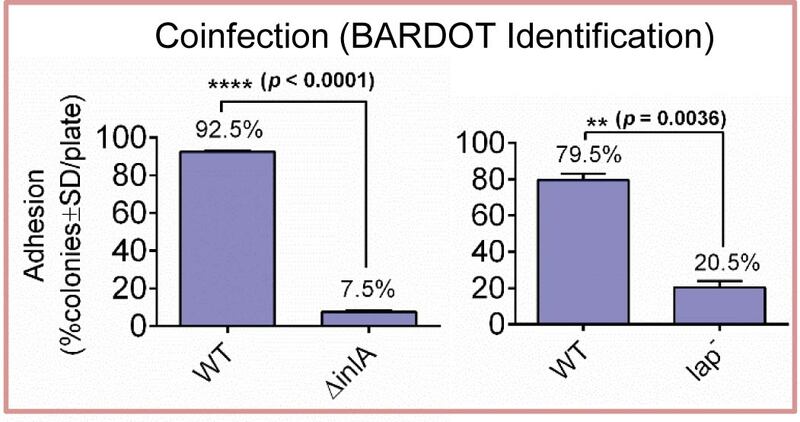 These data clearly indicate that the BARDOT method unequivocally quantifies the ratio of the WT and mutant strains on the same plate during a coinfection study, and demonstrates specific roles of LAP and InlA in adhesion of and invasion into Caco-2 cells, as the respective mutant strains showed reduced infection (Fig. 2). Fig. 2. BARDOT based identification and enumeration of adhered colonies of the WT and lap mutant strains or the WT and ΔinlA strains after coinfection of Caco-2 cells. The BARDOT can serve as a companion screening tool with the existing detection methods for the food industry and public health laboratories, and could be applied in resource constrained location with minimal expenses and expertise. Such capabilities of the BARDOT method could be used to make scatter pattern-based informed decisions to distinguish/screen mutant colonies during routine bacterial pathogenesis/genetic manipulation studies. This study was funded by the U. S. Department of Agriculture through Center for Food Safety Engineering (CFSE) at Purdue University. Virulence Gene-Associated Mutant Bacterial Colonies Generate Differentiating Two-Dimensional Laser Scatter Fingerprints.